Soulful Live Trio at Omaha Lounge, April 29, 2017. The plan was to go see The Lupines Saturday night at Brothers Lounge. But instead, on a lark, Teresa and I decided to drop in at The Omaha Lounge for a drink. For the last couple weeks I’d been bombarded with ads in Facebook from this place, which is located right next to Pickleman’s downtown at 1505 Farnam. Their website boasted live jazz and blues in an historic building, and a drink menu that included something called an “Uncle Pete,” which is a sly marketing homage to Union Pacific, along with other drinks named after old Omaha businesses. The place was as described — an old storefront on the ground level of the Baxter Building, with all the original woodwork, ceiling tile, art deco lighting fixtures and a vintage bar that stretched along most of the length of the room. Very tasteful. However, whoever took over the place decided to replace the furniture with giant, boxy, clumsy, pleather-covered chairs so wide they bump into each other and crowd into the aisles — just awful furniture that probably cost the new owners a ton and, unfortunately, should be dumped immediately and replaced with standard club chairs and tables. The lounge doesn’t have a stage. Instead, performers play near the entrance where a PA has been placed next to a grand piano. 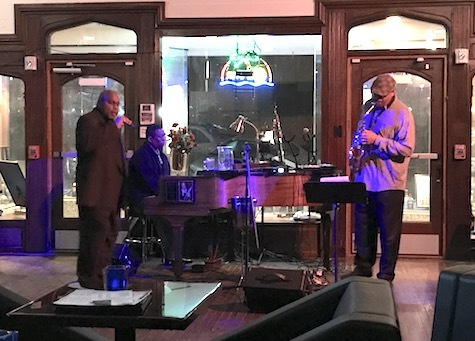 Saturday night’s entertainment was provided by The Soulful Live Trio, a combo that included a piano player, saxophonist and vocalist who performed covers ranging from “Just the Way You Are” to “Sitting on the Dock of the Bay,” accompanied by pre-recorded rhythm tracks. The singer was first class, and quite a lounge lizard on the microphone. As good as his vocals were, the most intense moments came when the sax and pianist went full-on jazz and ripped through a few standards, showcasing their talent. I’m not a jazz guy, but anyone would enjoy these guys, especially after a couple drinks. I ordered the aforementioned Uncle Pete, which was the lounge’s version of a Mai Tai — delicious… and potent. Teresa ordered something called The Paper, which was a classic chocolate martini. Lounge drinks at lounge prices — two rounds put me back $40. It’s a busy Monday night. Tonight Charly Bliss returns to Reverb Lounge. The indie act’s new album, Guppy, was just released on Barsuk. Joining them is another band about to launch a new album, our very own See Through Dresses, who began pre-sale for Horse of the Other World last week at Tiny Engines. $10, 9 p.m.
Also tonight, Eklund/Higgins 30 Days, a new project by Greg Eklund, former drummer of Everclear, and Omaha legend Dereck Higgins, debuts at fabulous O’Leaver’s. Opening is Rouge Moon, Chalant and Phil Kolbo. 9 p.m.